I don’t often have the time for anything outside of tech journalism these days (Seamus gotta eat,) but when Jim Dalrymple asked me if I’d like to write a piece for The Loop Magazine about anything I damn well please, I made room in my schedule. Step Right Up is the story of Lesley and Karl Thurston-Brown: two of the nicest people I’ve ever had the pleasure of talking to about their profession. Did I mention that they’re sideshow performers? No? OK, well, they totally are. 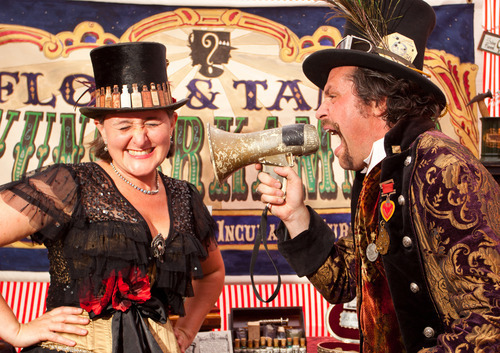 Performing as Prof. Archibald Floss, Human Oddity & Dr. Charlotte Tann, Snake Oil Pedlar of Some Global Renown, they’ve been pleasing audiences with their Mental Floss sideshow for years. But no matter how great their show is, the story of how they met trumps anything you’ll see on stage. I know you want to know more. If you own an iOS device, you can see what’s behind the curtain by investing in a monthly subscription to The Loop.